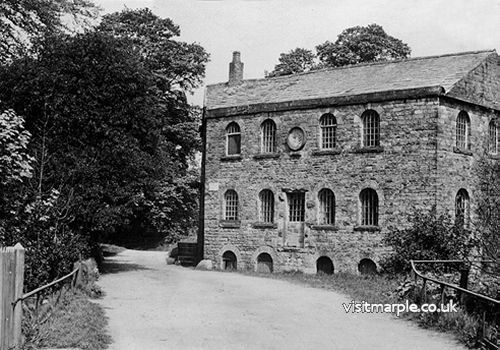 Mellor Mill was crowned with a central triangular pediment containing a piece of oval stonework that can just be made out in the photograph below. This stone was carved with Oldknow's initials, a weavers shuttle and the year 1790. It is believed that this date refers to the year that construction commenced, as records show that the mill was not fully completed until 1793. The stone now lies in Memorial Park, a small monument to Oldknow's achievements. The main mill building was an imposing structure with a central section six storeys high, 42 feet wide and 210 feet long. At each end of this was a further three storey section bringing the total length to 400 feet. The mill was constructed from locally quarried stone and bricks that were probably made on the site, or nearby. The wheelpit in the basement of the central section contained the 22 feet diameter by 17.5 feet wide "Wellington Wheel", which was initially the mill's single source of power. In order to supply water to this wheel Oldknow literally reshaped the landscape and the Cheshire/Derbyshire county boundary formed by the River Goyt. The river was re-routed along a new cutting and a weir, sluice gate and leat were constructed to diverted water into a large millpond. This fed into a second large millpond to the rear of the mill, which can be seen in the photograph top of page. This pond was also fed by stream from a third smaller pond constructed at Linnet Clough. The largest of these millponds later became a huge tourist attraction and was christened "Roman Lakes" in Victorian times. It still remains in use today, mainly as a venue for course fishing. A separate corn mill was sited at the south end of the main mill, powered by its own wheel of unknown dimensions. It is not clear if this was constructed at the same time as the main building, or if it was a later addition. In 1815 a third wheel was added in a separate new building between the main mill and the river. Named the "Waterloo Wheel", it measured 20 feet in diameter and 18.5 feet wide. This wheel was powered by the exit water from the other two wheels via a system of underground tunnels. When not in use the water could be returned directly to the Goyt through a separate tunnel. The "Waterloo Wheel" supplied additional power to the main mill via an underground shaft, whilst a second shaft provided power to series of riverside workshops. The exit level from the bottom of this wheelpit was below that of the Goyt at its nearest point and in order to overcome that problem a significant feat of engineering was required. An exit tunnel was driven under the bed of the river and then carried the water 600 yards downstream until the level had fallen sufficiently to allow it to be discharged. The Mellor Mill was built to spin the lower counts of yarn on Arkwright type water-frames or "throstles", the higher counts being produced at the Hillgate Mill in Stockport. (The count of a cotton yarn is a measure of its fineness, the higher the count the finer the yarn. The number of the count represented the number of hanks of yarn to the pound weight). The "throstles", carding engines and other machinery at the mill for producing cotton were mainly operated by women and children. The total number employed at the mill was between 300 and 350, of which only 15 to 25 were men employed as mechanics or labourers. Although able to draw on a pool of experienced textile workers from the local area, these were insufficient for Oldknow's needs and he found it necessary to bring in a large number of immigrants who needed training. Many of these were pauper children, or parish apprentices and a significant portion came from Clerkenwell in London. Oldknow is said to have been a particularly benevolent employer and his workers were well treated by the accepted standards of that time. Nevertheless, they would have worked a thirteen hour day, with probably only two short meal breaks in-between. The Mill reached its peak production in 1804, when 10,080 spindles were operating and around 550 people were employed. In addition to the Mill, Oldknow undertook a great deal of other works on his Mellor Estate. He built a new road access from Marple, which cut diagonally down across the steep bank known as Goyt Cliff and at the bottom constructed the handsome stone "Bottoms" Bridge, taking this road over the Goyt and giving better access to the Mill. He also made improvements to several other roads in the area, particularly the main route to Stockport which was repaired and widened. Bridges were constructed at the bottom of Dan Bank and at Fog Brook in Offerton and this became a turnpike road with a toll cottage built at Dan Bank. 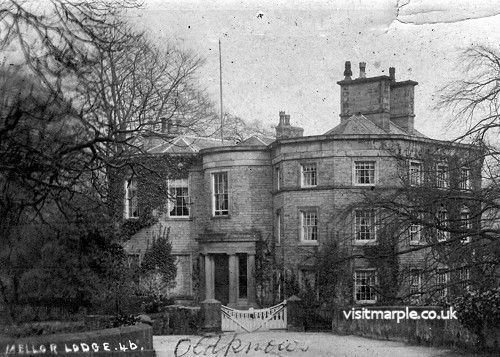 During the construction of the Mill Oldknow lived at Hyde Bank Hall in Romiley, where he made extensive improvements. When the Mill was completed he built himself a new home situated close to the mill on the Mellor bank of the River Goyt. This attractive mansion set in beautiful riverside surroundings was completed in 1794 and was called Mellor Lodge. In the 1930's the Lodge was used as a girls school but was later vandalised while it stood empty and was eventually demolished in 1949. In 1800 Oldknow built Bottoms Hall and the adjoining farm and outbuildings. Here also was purpose built accommodation of an unusual three storey design to house the apprentices who worked at the Mill. It is even rumoured that there was a tunnel connecting Bottoms Hall and the Mill, allowing the apprentices to travel to and from work without being molested by any unsavoury characters on the road. There is no evidence to support this, although a short tunnel does exist leading into the front garden of Bottoms Hall which may have gone someway towards this purpose, allowing the apprentices to reach the Mill using a path along the far side of the millpool. Bottoms Hall is one of the few of Oldknow's buildings that remains intact to this day. As with everything he did Oldknow was a perfectionist and his farm was no exception. It is said that it was a model far in front of its time, with excellent accommodation for cattle and a small waterwheel for driving machinery such as chaff and turnip cutters. He was an outstanding agriculturist and encouraged his tenant farmers to improve the quality of their land by draining, manuring and liming. 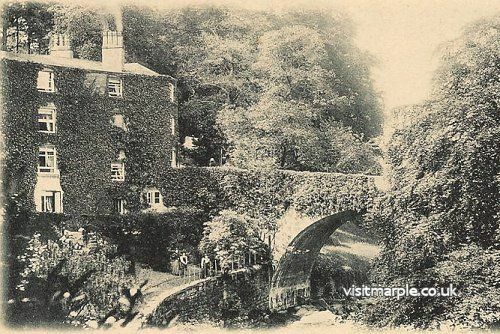 In 1801 Marple Lodge was built on the opposite bank of the Goyt to Mellor Lodge to serve as the Mill Manager's house. Later John Clayton, Oldknow's half-brother, would live here when he became manager. Sadly, this is another fine building that did not survive the destructive 1940's and 50's. When Oldknow died in 1828 his debt to Richard Arkwright Jr. was almost equal to the value of his estate, which Arkwright accepted in settlement. He allowed John Clayton, who had already been the Mill Manager for a period of four years, to take over the full running of the manufacturing business on his behalf and it continued to trade under the name of John Clayton and Co. throughout the remainder of its life. By the mid 1800's steam was the operating power in most large cotton mills. It is a tribute to the fine engineering works at Mellor that it was able to remain water-powered for most of its life and it was not until 1860 when two new steam engines and boilers were installed. These were enclosed in a new building situated to the north of the main mill structure. ...."Immense tongues of fire were belching forth from the windows. Higher and higher they leaped and blazed, the building and its environs being encircled with a halo of crimson light. A message was despatched to Marple and Compstall fire brigade, but they arrived too late to be of any practical service. The spectacle when the fire was at its height was a splendid but awe-inspiring one. The entire mass of buildings, which covers half an acre in area, was in gigantic blaze, brilliantly illuminating the district. Huge columns of smoke ascended into the heavens and hung in the form of a dense canopy over the burning building. One by one the floors fell in with a deafening crash and the machinery clanged together like the roar of artillery. Then the roof with one gigantic swoop collapsed, falling through the practically demolished building with a thunderous smash, amidst the shrieks of the by-standers, for all the village was now awake. The mill girls with their shawls over their heads, the children clinging, terrified, to their mother's dresses, and the men who had been striving to render what little assistance there was in their power, were all gazing at the burning pile......"
After the fire substantial portions of the mill remained for many years, especially the smaller buildings on the bank of the river Goyt. It was in the upper room of one these, a coach house and stables, that the huge collection of letters, papers and accounts detailing Oldknow's affairs were discovered in 1921. The study of these documents lead to the publication of the book "Samuel Oldknow and the Arkwrights", the definitive work on this subject by George Unwin. The Cornmill survived the fire intact and remained until the late 1930's, when it was demolished. 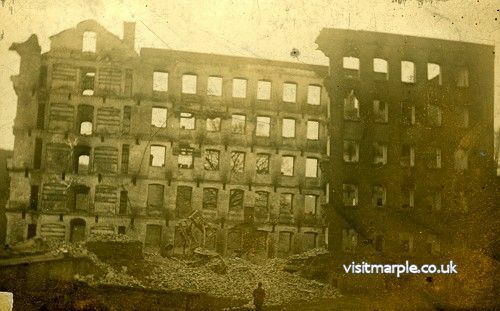 The remains of the main mill were demolished too as they were unsafe and presented a danger to life and limb. Today no trace of the huge enterprise remains above ground and to the casual eye the area, overgrown and covered by trees, gives no indication of what once stood there. On closer inspection however, the two deep pits which housed the huge Wellington and Waterloo wheels are revealed, along with the stone lined tunnels which carried the water to and from them. Although crumbling and moss covered, the quality of the stonework and attention to detail still to be seen in these tunnels hints at the majesty of the structure they were once a part. Accompanying this article are pictures of the superb model of the mill and its surroundings constructed by Tom Oldham for the 1990 Oldknow Bicentenary Festival. This is usually on display in the heritage section of the Marple Library and gives some indication of the scale of Oldknow's achievements. An abbreviated version of this page appeared as an article by Mark Whittaker in the September 2001 issue of the Community News, in our regular feature "Local History & Heritage with the Marple Website"
For further information visit Mellor Archaeological Trust's web site and the Oldknow Legacy Project.